John Oliver's job has generally been to stick his nose into business not directly related to him but generally he sticks at least to a country he pays taxes in. Oh, that's right, in case you didn't know, despite advocating for leftist politics he, like John Lennon decided to pay taxes in America so socialist policy doesn't affect his bankroll so much. For that matter, as Observer reported last year, Oliver utilized a loophole established by Donald Trump in order to "scam" the property tax as Observer puts it. Oliver had a tax attorney set up an estate <a href="https://observer.com/2017/05/john-oliver-property-tax-scam-trump/">in order to hide the $9.5 million dollar penthouse</a> he owns in Manhattan to avoid even paying as much in his host country he moved to in order to take advantage of a more favorable tax bracket. But we're not here to talk about John Oliver's hypocrisy on taxes, we're here to talk about the smell of fear emanating though the HBO airwaves after his October 7 episode of his weekly comedy program. 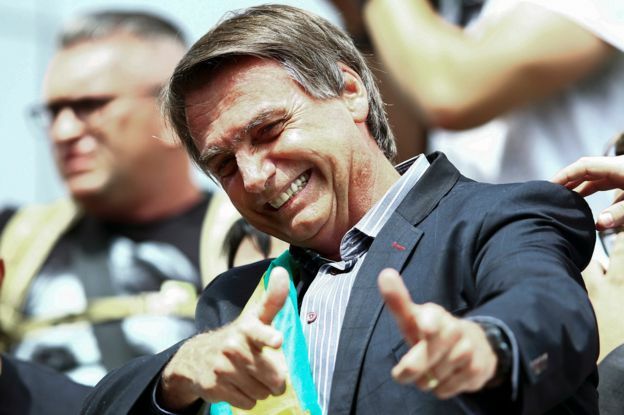 It's not especially common for him to complain about policies outside of the host country whose favorable tax laws he enjoys, but it's a sign that Bolsonaro's commanding lead (16.7% lead at 46% versus Fernando Haddad's 29.3% at press time) is concerning to Oliver and his handlers considering he's covering the election. Don't worry about giving ad revenue to Oliver by clicking the embedded link, btw. I made sure not to link to a pirate copy rather than the official Last Week Tonight channel. The Brazil section shows up at around the 10m45s section. Oliver explains first the issues with the traditional candidates. With over 63,000 murders in Brazil and some 30% of Rio in crossfire it's fairly understandable that there would be "general dissatisfaction about crime" as he puts it. He goes into the a quick rundown of the "Operation Car Wash" scandal. (Very quick, mind you as it is "way too complicated to get into right now" he claims). Lula's connection to Car Wash which was implicated in bribes, contracts and kickbacks led to his arrest and PT, "the Worker's Party" is running Haddad who is currently over 17 million votes behind Jair Bolsonaro with 99% of precincts currently reporting. Oliver shares a clip of Anderson Cooper (because come on, who doesn't trust Anderson Cooper) interviewing Deltan Dallagnol, lead prosecutor in "Operation Car Wash" who explains with over 2 billion in bribes it was "bigger than Watergate. As a result, it's understandable that it would have "rocked Brazilians faith in their government." Of course he gives Bolsonaro the "Trump treatment" attacking him with everything <i>and</i> the kitchen sink. Not surprising considering the highly popular, incredibly populist candidate has been called Brazil's Donald Trump. According to Oliver, "the nicest thing you can say for him is you can not say he has been implicated in a corruption scandal… yet" but on top of that "he's a terrible human being." At this point, the comedian cuts to some UK news which argues Bolsonaro is "racist, misogynistic, homophobic and even anti-democratic." Oliver touches on a story we covered regarding how his supporters not only continued to rally around him but drew even more followers at the time an unhinged attacker stabbed him. Oliver makes sure to mention the #EleNao ("not him") campaign without any mention to the (much larger)n #EleSi ("it's him) trend that we covered. Bolsonaro is definitely at least going to the next round in the elections but if the next round is anything like the most recent vote it appears Time Magazine's begrudging admission that Bolsonaro may be Brazil's next president is more of a possibility than many in the Brazilian media have wanted to admit. the world needs more donald trumps !!! the eu especially needs right now!!! the uk france and germany are burning and no has the balls to stand up and opt up of eu. afew have italy poland hungary and for that the eu is trying to punish them. we all need to stand and say enough we don't want anything more , we want our sovereign back the eu has ruined so many countries they are burning while the elite try to take our sovereign away while taking our wealth and do nothing except to bankrupt each and every country. some are finally saying no more. get out now or your country your people will be no more.so in the countries find your donald trumps before you no longer have country a government. greece they have beaten them down and taken away everything while the eu sits back and just keep taken their country their government their money and they tell them you have to stop living just barely exist.people going through garbage to find something to eat. is this the world you want?